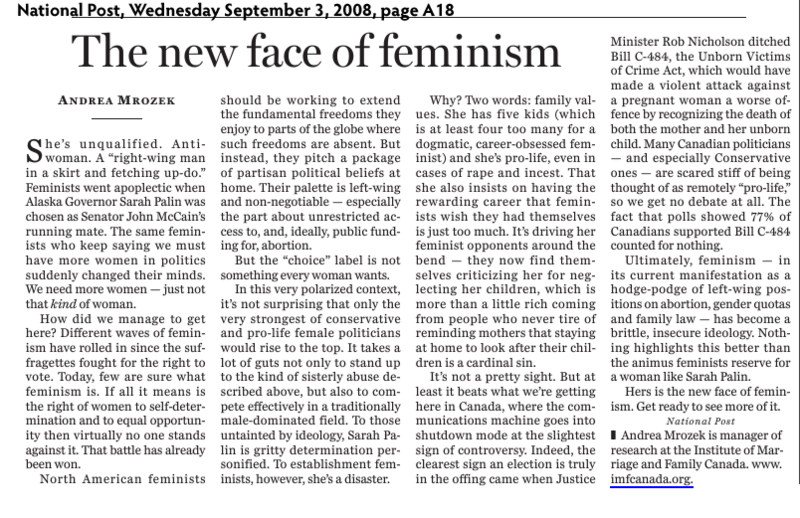 If you are even just the smallest bit interested in this idea called “feminism”–read this article. It identifies “social feminism” as contrasted with “egalitarian feminism.” Most to all of the totally wacked out (inside voice, Andrea!) feminists in today’s public square, in academia and in politics are “egalitarian feminists.” This means they downplay or don’t believe in gender differences. Those feminists are trying to erase social feminists from history, says the author Christina Hoff Sommers. Or they villify them, because they stood up in favour of women’s rights whilst expecting that women still could conduct themselves as ladies. Hence the post title from one such social feminist, Frances Willard, who said that “with the vote, women could protect the homes they dearly loved. Indeed, Willard referred to the vote as ‘the home protection ballot. '” Interesting. Whereas social feminists ask for an even playing field–equality of opportunity–while allowing women and men to turn toward their natural inclinations. Exposés on feminist theory that are reasonable (as opposed to shrill or bitter) are hard to come by. I recommend this (long-ish) article. I find this ironic because my experience (as a Christian young lady with egalitarian leanings) has been the exact opposite. The egalitarians I’ve talked to and whose articles I’ve read have constantly stressed the fact that people are *individuals* and shouldn’t be constrained to behave in *any* one narrow feminine model. They want women to have an equal playing field but the choice of what path to take. In other words, most egalitarians believe that women should be able to follow their inclinations whatever they are, whether it’s staying at home and being a full-time mom or being the CEO of a major company or some entirely different sphere of influence. Because *all* women don’t want to be SAHMs and *all* women don’t want to be career women. They believe that each choice is as valuable as the other. They definitely don’t claim that men and women are the same; They maintain that women are *naturally* superior to men in character, inclination, and behavior. Perhaps your idea of egalitarian feminism is missing a key component: Input from the egalitarian feminists themselves. From what you’ve written, it sounds like your source of information has been articles written by anti-egalitarians. I would encourage you to do some research on egalitarian thought from ‘our’ perspective. Egalitarians are neither the hostile man-hating social feminists nor the androgyny-touting everyone must be exactly alike feminists nor the women belong only in the home social feminists. They are another category altogether. Very thoughtful and well presented. There are still so many men out there who think women do not deserve equal rights as humans and citizens. Women who are “anti-egalitarian” truly don’t understand what it means to be a powerless second class citizen, as women were before feminism and before the brave activists who fought for equal treatment. And make no mistake, there are those out there who would love to have these standards back.